To Cite: Ghafoori M, Alavi M, Shakiba M, Hoseini K. The Value of Prostate MRI with Endorectal Coil in Detecting Seminal Vesicle Involvement in Patients with Prostate Cancer, Iran J Radiol. 2015 ; 12(1):e14556. doi: 10.5812/iranjradiol.14556. Background: In prostate cancer, detection of seminal vesicle involvement is important because it influences the treatment planning and prognosis of the patients. Objectives: The objective of this study was to determine the value of prostate MRI with endorectal coil in the detection of seminal vesicle involvement in patients with prostate cancer. Patients and Methods: A total number of 238 biopsy-proven prostate cancer patients were examined by 1.5 Tesla MRI with a combination of pelvic and endorectal coils to detect seminal vesicle involvement. After radical prostatectomy, the MRI results were compared with pathology results. Results: Seminal vesicle involvement was detected in 67 (28.1%) patients. Pathology confirmed the involvement of seminal vesicles by prostate cancer in 63 patients. In two patients, seminal vesicle involvement was diagnosed by pathology but not detected by MRI. The sensitivity was 0.97 [95% confidence interval = 0.89-0.99], the specificity was 0.98 [95% confidence interval = 0.94-0.99], the positive predictive value was 0.94 [95% confidence interval = 0.85-0.98], and the negative predictive value was 0.99 [95% confidence interval = 0.96-0.99]. Conclusion: MRI with endorectal coil is a valuable imaging technique with suitable accuracy in detecting seminal vesicle involvement in prostate cancer. Prostate cancer is a slow growing tumor usually without any sign or symptom in the early stages of the disease (1). Measurement of serum prostate specific antigen as a screening test and transrectal ultrasonography (TRUS) guided prostate biopsy in suspicious men help in the early detection of prostate cancer (2, 3). Early diagnosis and treatment of the disease, when the tumor is confined to the prostate capsule, leads to complete cure of the patient with excellent prognosis. If it remains undiagnosed, the tumor will extend to the prostate capsule with subsequent invasion to periprostatic tissue and involvement of periprostatic fat, neurovascular bundles, seminal vesicles, Denonvillier’s fascia and in more advanced stages to the bladder base and farther pelvic structures. The tumors that are limited to prostate capsule have better prognosis and are usually treated by radical prostatectomy, but the tumors that are extended beyond the prostate capsule have worse prognosis and are usually treated by radiation therapy. Involvement of seminal vesicles is one of the important factors in treatment planning and patient prognosis. Before widespread use of MRI, in a great number of patients, seminal vesicle involvement remained undetected until performing surgery. Baseline PSA, biopsy Gleason sum and maximum tumor volume of prostate cores are used traditionally for clinical staging of prostate cancer, but it is not accurate in the prediction of T stage of the tumor. In many patients with T3 stage prostate cancer, it leads to understaging (4). High resolution MRI with endorectal coil for local staging of prostate cancer after detection of prostate cancer in transrectal ultrasonography (TRUS) guided biopsy is recognized as the most accurate method in detecting tumor extension. It influences treatment planning and helps to choose the most suitable plan for the patient and to estimate the prognosis (5-9). The objective of this study was to determine the value of prostate MRI with endorectal coil in detecting seminal vesicle involvement in patients with prostate cancer. From April 2011 to August 2013, the total number of 238 patients proven to have prostate cancer by TRUS guided biopsy were enrolled into the study. The objectives and methods of the study were explained to all subjects and written informed consent was obtained. The protocol for the research project has been approved by the Ethics Committee of Iran University of Medical Sciences and it conforms to the provisions of the Declaration of Helsinki (as revised in Edinburgh 2000). High resolution MRI of prostate gland was obtained in all patients with a 1.5 Tesla MRI machine (Avento, Siemens, Erlangen, Germany) using a combination of pelvic phased array and endorectal coils. MR study was performed at least 4 weeks after biopsy. This 4-week time was given for absorption of post biopsy hemorrhage in the prostate. The protocol of the study was as follows: axial, coronal and sagittal T2 weighted turbo spin echo images (TR = 5650 ms, TE = 100 ms, slice thickness =3 mm, field of view=190 × 190), axial T1 weighted turbo spin echo images (TR = 450 ms, TE = 14 ms, slice thickness = 3 mm, field of view = 190 × 190), volumetric interpolated breath hold examination (VIBE) images (TR = 4.9 ms, TE = 1.8 ms, slice thickness = 3.6 mm, field of view = 240 × 240) in multiple phases before and after intravenous injection of gadolinium contrast agent (Gadovist, Bayer pharma, Berlin, Germany). All images were reviewed on one workstation by an expert uroradiologist to detect seminal vesicle involvement. After radical prostatectomy that was performed in a maximum of 20 days after MR study, the MRI results were compared with pathology results. The prostate cancer patients who did not have radical prostatectomy or with uncertain pathology data were excluded from the study. The statistical analysis of the collected data was performed by SPSS version 16 (SPSS Inc., Chicago, Il, USA). The values of the variables were given as means±standard deviations. For comparison of the continuous variables between two groups, at first we evaluated the normality of the data. If the data were distributed normally, we performed the t-test for comparison of the means between the two groups. Otherwise, we performed the nonparametric U-Mann Whitney test for the comparison. All p-values less than 0.05 were considered significant. Considering the total number of patients, the mean age was 67.4 ± 9 years, mean PSA level was 16.7 ± 18 µg/mLand mean Gleason score was 5.7 ± 2. The mean age of the patients with seminal vesicle involvement was 70 ± 9.1 years, while this figure was 66.6 ± 8.6 years in the other group (P = 0.009). The mean PSA level in patients with seminal vesicle involvement was 27 ± 26.2 µg/mL, while this figure was 13 ± 13.4 µg/mL in the other group (P < 0.001). The mean Gleason score in patients with seminal vesicle involvement was 7.9 ± 1.1, while this figure was 4.9 ± 1.1in the other group (P < 0.001). Seminal vesicle involvement was detected in MRI in 67 (28.1%) patients. After radical prostatectomy, pathology confirmed the involvement of seminal vesicles by prostate cancer in 63 (23.5%) patients. In 175 (73.5%) of the patients, seminal vesicles were intact without evidence of tumoral involvement. In two (0.8%) patients, seminal vesicle involvement was diagnosed by pathology but not detected by MRI (Figures 1 and 2). The sensitivity, specificity, positive predictive value and negative predictive value of MRI in detecting seminal vesicle involvement in patients with prostate cancer were as follows; the sensitivity was 0.97 [95% confidence interval (CI) = 0.89-0.99], specificity was 0.98 [95%CI = 0.94-0.99], positive predictive value was 0.94 [95%CI = 0.85-0.98] and negative predictive value was 0.99 [95%CI = 0.96-0.99]. In addition, the positive likelihood ratio and negative likelihood ratio of MRI with their 95% CI were 42.9 (16.3-113.1) and 31.8 (8.1-124.3), respectively. Figure 1. 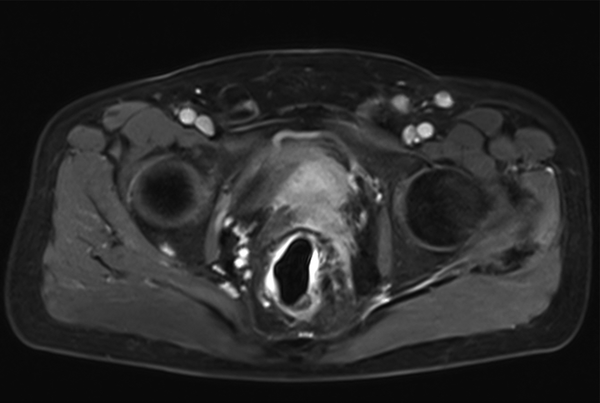 MRI of the prostate using of endorectal coil in a 70-year-old man with Gleason score 6 prostate cancer. A, axial, B, coronal and C, sagittal T2 weighted images of the prostate depicts involvement of the left seminal vesicle. Detecting seminal vesicle involvement is an important part of local staging of prostate cancer and it has great impact on treatment planning and prognosis (10). Patients with locally advanced prostate cancer are mostly treated by radiation therapy rather than radical prostatectomy. Treating patients with stage T3 prostate cancer either with external beam radiation therapy or radical prostatectomy affects the health related quality of life (11). Seminal vesicle involvement also influences local recurrence of prostate cancer either after radical prostatectomy or radiation therapy. Before widespread use of MRI for local staging of prostate cancer, making decision about treatment strategy was mainly based on the PSA level of the patients and Gleason score and tumor volume reported by pathologist after TRUS guided biopsy (clinical staging) (4). Our study showed that there is significant difference in the PSA level and Gleason score between two groups of patients with and without seminal vesicle involvement. The PSA level and Gleason score are significantly higher in patients whose seminal vesicles were involved, but this is not absolute. We had patients with a PSA level of 58 µg/mL and a Gleason score of 9 without involvement of seminal vesicles and a PSA level of 0.8 µg/mL and a Gleason score of 6 in patients with seminal vesicle involvement. It means that there is a wide range of overlap between the two groups regarding PSA level and Gleason score. There are many patients suspected to have limited disease and after they undergo surgery, they show a locally advanced disease that is diagnosed after radical prostatectomy and pathologic evaluation of the resected specimen. In a study conducted by Park et al. the accuracy of endorectal MRI in predicting extraprostatic extension and seminal vesicle invasion in clinically localized prostate cancer was evaluated in 54 patients. A sensitivity of 75% and specificity of 92% was shown (12). They stated that MRI is more accurate in detecting seminal vesicle involvement in higher Gleason score levels and it shows better sensitivity in high-grade tumors. Watter et al. in a study on 81 patients evaluated the value of endorectal MRI, Gleason score of biopsy specimens and preoperative PSA levels in local staging of prostate cancer and especially differentiating between T2 and T3 stages tumors (13). They stated that obliteration of recto-prostatic angle seen in endorectal MRI and total pathologic Gleason score have the best predictive value for diagnosis of stage T3 prostate cancer. Our study also showed the high accuracy of MRI in detecting seminal vesicle involvement with high sensitivity and specificity. Kim et al. in a study on 32 patients evaluated the accuracy of MRI in local staging of prostate cancer by only using surface coil. They reported a sensitivity of 82.4% and specificity of 87.2% (10). They stated that accurate local tumor staging is important. It affects the prognosis and plan for treatment. Lee et al. in a study on 91 patients compared the accuracy of MRI in local staging of prostate cancer using only pelvic phase array coil and only endorectal coil (14). They reported the area under the curve (AUC value) of 0.671 for endorectal coil and 0.657 for pelvic phase array coil. They stated that there is no significant difference in the assessment of seminal vesicle involvement between the two methods and using surface coil is more comfortable for patients. In our study, we achieved high sensitivity and high specificity in detecting seminal vesicle involvement because of obtaining high-resolution MR images of prostate with simultaneous use of endorectal and pelvic phase array coils. Futterer et al. in a study on 99 patients showed that dynamic contrast-enhanced MRI added to T2-weighted images will improve the accuracy of prostate cancer staging especially for less-experienced radiologists (15). In our study, we used both T2-weighted images and contrast enhanced images to detect seminal vesicle invasion. In this study, we reported a sensitivity of 97% for detection of seminal vesicle involvement. To the best of our knowledge, this is higher than the sensitivity reported in all previous published studies. We believe that the detection of prostate cancer and its extension greatly depends on the experience of the reporting radiologist. This experience increases significantly with team-work between the radiologist, clinical pathologist and urology surgeon. The report from the pathologist and urologist on each patient is the best tool for a radiologist to be aware of the potential pitfalls and to avoid the situations in MR studies that may be mistaken for seminal vesicle involvement. Since all the reports of this study were performed by a single radiologist with more than 8 years of experience in the MRI of the prostate with a large number of patients referred from different areas of the country, the accuracy of reports were higher than many foreign countries that do not have such high number of patients. In addition, in this study, we used the two most important parameters (multidirectional high resolution T2W images and dynamic contrast study) to detect seminal vesicle involvement. This study showed that high resolution MRI using endorectal and pelvic coils is highly accurate in detecting seminal vesicle involvement and it is much more reliable than reports of PSA level and Gleason score for decision making about treatment strategy. It is suggested that all patients with prostate cancer proved by TRUS guided biopsy undergo local staging. At the end, we conclude that MRI with endorectal coil is a valuable imaging technique with suitable accuracy in detecting seminal vesicle involvement in patients with prostate cancer. The authors thank the Department of Radiology of Hazrat Rasoul Akram Hospital, Babak Imaging Center and the Department of Radiology of Payambaran Hospital. Authors’ Contributions: All the authors have contributed extensively to the work presented in this paper. Funding/Support: This study was supported by a research grant from Iran University of Medical Sciences, Tehran, Iran.